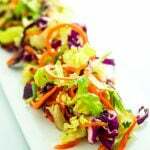 This rainbow Thai salad recipe is loaded with a spectrum of veggies and drizzled with a zingy dressing. It’s crunchy, fresh, and perfectly spicy. Prepare all ingredients as listed in the ingredient list and add to a large bowl. In a small bowl combine the dressing ingredients and mix. Add dressing to the large bowl of salad and toss. If you aren’t a fan of spicy food you can leave the chili flakes out or decrease the quantity.